As westward expansion spread across the United States, so followed the railroads. Passengers often spent days on board as they traveled west. A picnic basket might get one through the first day, but staying fed was an issue during the days of early passenger service. There were no coolers, no refrigeration. Being left to fend for oneself for a meal during a station stop opened the door for exploitation. Riders were often the victims of poor food and high prices, if anything to eat was even available. This was the inspiration that resulted in the Harvey Girls. Fred Harvey was a forward-thinking businessman and a bit ahead of his time. He and his friend, Tom Gable, stopped at a restaurant in Raton, New Mexico, and found it to be a chaotic mess. According to Katrina Parks, director of The Harvey Girls: Opportunity Bound, Tom came up with the idea that adding women to the staff might “bring down the testosterone” level. Women were “reliable and effective employees.” He opened his first restaurant along the rail line in Leavenworth, Kansas. He was able to contract with the Atchison, Topeka, and Santa Fe line, which spanned from New York to New Mexico. 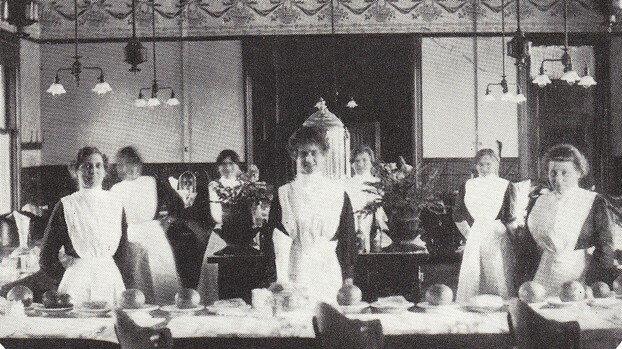 Hundreds of thousands of women left behind their homes and poverty between the 1880s and 1960s to work for the Harvey House restaurants that Fred Harvey established. These courageous women answered newspaper ads placed by Fred Harvey, asking for women who were single, white (consider the time in which the restaurant chain was established), and between the ages of 18 and 30. They had to be of good moral character, well-mannered, attractive, and intelligent with at least an 8th-grade education. Mr. Harvey wanted travelers to eat well. He is credited with providing good, wholesome food in a hurry. He knew passengers had 30 minutes to get off the train, eat, and get back on the train. He was successful because the railroad workers stayed in touch with the restaurant via the telegraph, so each Harvey House knew if a train was going to be late, and approximately how many hungry people they would have to feed. During World War II, they served troop trains, often filling every nook and cranny with hungry soldiers. Each waitress was trained in the way the Harvey House operated, and signed a six-month contract to work at a particular restaurant along the railroad line. At the end of six months, they could apply to work at a different location or stay at the current one. Seniority sometimes came into play, and many of the workers opted to put down roots and stay with one restaurant. These women were true pioneers in the sense that they worked outside of the home at a time when few women did so. They traveled west into the unknown, searching for a better life. Thanks to Fred Harvey, they were able to have a career and stand on their own, if that is what they wanted to do. 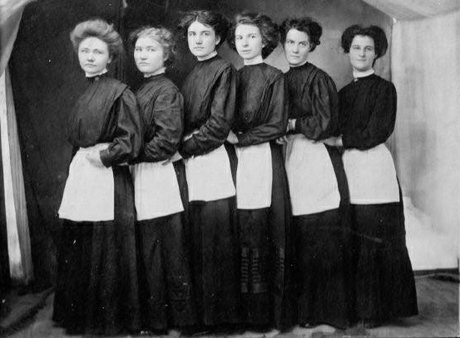 Many started families and a new tradition: often, daughters would follow their mothers into becoming one of the Harvey Girls. Fred Harvey’s lunchrooms, restaurants, and hotels served the American traveler until the death of his grandson in 1965, adjusting to trends in travel, including ‘oases’ along Interstate 294 in Illinois. Fred Harvey is credited with creating the first restaurant chain, and he did it with his Harvey Girls. There are many museums containing artifacts from the Harvey Girls’ heyday. An Internet search will lead you to more information on this rich part of the history of the United States. 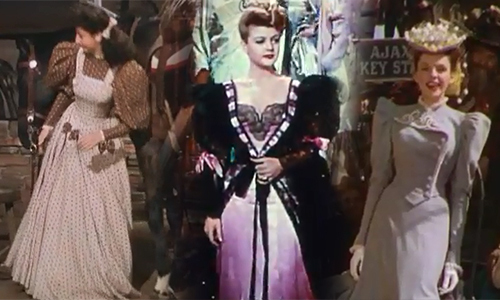 The Harvey Girls cemented their legend in 1946 with the release of the movie by the same name directed by George Sidney and starring Judy Garland. 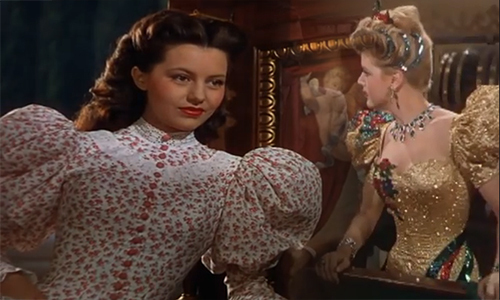 This was costumer, Helen Rose’s first film, and she did an exquisite job of using late Victorian fashion and the Old West as her inspiration for the garments worn by Judy Garland, Angela Lansbury, Virginia O’Brien, Cyd Charisse, Marjorie Main, John Hodiak, Preston Foster, Ray Bolger, and all of the women and men appearing in the film. If you love turn-of-the-20th-century and Old West designs, you’ll be inspired by this movie. Peruse the Recollections online catalog for inspiration on creating the look that is just right for you! 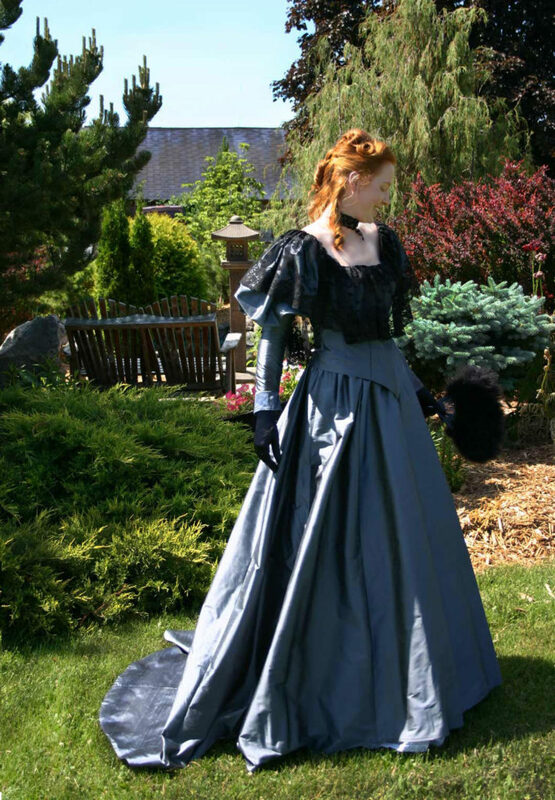 Here are a few ideas, Quinn Riding Suit, Sophronia Edwardian Gown, and Agatha Apron. 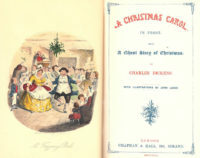 “The Harvey Girls, a Slice of American History.” Web log post. HubPage. N.p., 26 Apr. 012. Web. 26 Apr. 2012. <http://paradise7.hubpages.com/hub/The-Harvey-Girls>. “Harvey Girls Historical Society.” Orange Empire Railway Museum. N.p., n.d. Web. 5 Aug. 2015. 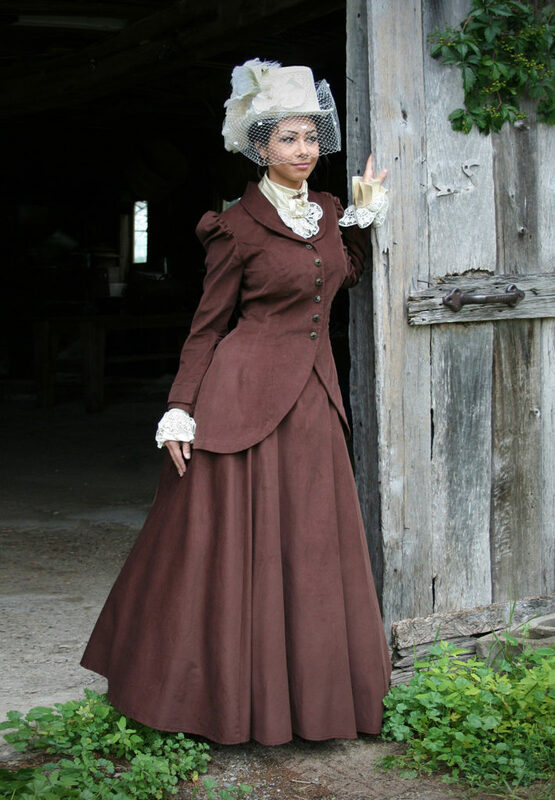 <http://www.oerm.or/harvey-girl-historical-society>. “The Harvey Girls.” IMDb. N.p., n.d. Web. 5 Aug. 2015. <http://www.imdb.com/title/tt0038589/?ref_=_al_tt_1>. “Hotels, Lunchrooms, Restaurants in the Old West.” Fred Harvey – Havey Houses – Civilzing the Old Wes. N.p., n.d. Web. 5 Aug. 2015. <http://www.harveyhouses.net/>. Kansas Historical Society. N.p., n.d. Web. 5 Aug. 2015. <http://www.kshs.org/>. Lequoia. “The Harvey Girls.” The Campfe Chronicle: True Stories of the American West. N.p., n.d. Web. 5 Aug. 2015. <http://stargazermercantile.com/the-harvey-girls/>. Sneak Peek at the Documentary, ‘The Harvey Girls: Opportunity Bound’ – The Local Show. Dir. Katina Parks. KCPT, n.d. YouTube. YouTube, 14 Nov. 013. Web. 5 Aug. 2015. <https://www.youtube.com/watch?v=Z9y5mNE5q2E>.